A beautiful First Communion font with grains of wheat and chalice in white alabaster, 6inches. Made in Italy. GSV001 A beautiful Communion Font with Lilies and Chalice in white alabaster, 5.5inches. Made in Italy. 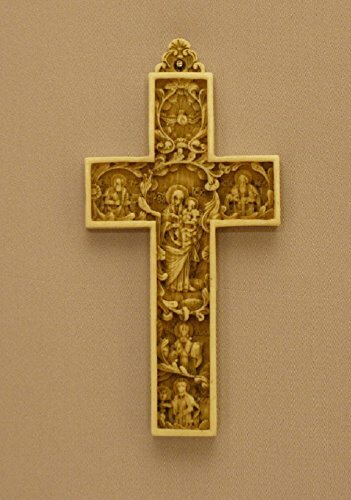 Cross in antiqued brass, 8.5inches. Made in Italy. Christ-Gethsemane sterling silver print on a wood plaque that stands or hangs, 1.5x2.25inches. Made in Italy. Praying Boy font in white alabaster with lightly hand-painted features and gold highlights, 4.5inches. Made in Italy. Praying Girl font in white alabaster with lightly hand painted features and gold highlights, 4.5inches. Made in Italy. St. Joseph and Child in dark brown alabaster, 6 inches. Made in Italy. Crucifix in lightly antiqued alabaster, 9.5 inches. Made in Italy. An antiqued brass crucifix, 12.5 inches. Made in Italy.